I loathe Thursdays. For me, it's the day that marks another week that we have lived without Adler, and part of me doesn't want life to go on without her. I want time to rewind and stand still so we can forever be a family in that same way. So I can look behind me in the backseat of our car and see the three children I was blessed to have in my second row and see my perfect Adler in our third row (just looking out the window or with her face pressed in between the headrests, especially if the kids had a snack and she wanted some), and my husband sitting right next to me. I felt lucky then - surrounded by people I loved doing just ordinary errands or sometimes extraordinary road trips together. Time I know can heal our grief but it can also rob us of our memories too. I can't believe Adler's been gone almost a month now. She has never been gone from me this long before even when we have been separated for vacations. I think our maximum time apart was maybe 10 days. Now it feels like eternity until I can see her again, and until then I don't want to forget how she smelled, how her fur felt or all of the things she loved including munchkins, rolling in the sand and the snow, and belly rubs. I am not sure what the proper amount of time is for grieving for your pet, but I am sure some would say it's time to move on. I'm not there yet although the waves of grief come a little farther apart now but they still come without warning and sometimes they can still knock the wind out of me and pull me under. I get up because I have to, because my kids and my husband expect me to, because it's acceptable to grieve as long as you want for another human being but not for another being. Peace and comfort comes sometimes in the strangest ways or at times when I least expect it. This past week, I woke up with a piece of Adler hair in my mouth. Now the cleaning ladies have come twice since her passing and I had just changed my sheets so a little odd that I would wake up and she would be present. I like to think of it as one way for her to let me know she was near. Last week, I also received a package and I didn't recognize the return address. Inside was a beautiful card with the Rainbow Bridge poem on it and three Bernese Mountain Dogs with their backs to me looking at the rainbow. The package included a tiny Berner angel pin - all sent from the Berner community. I have been part of a list serv of Berner owners and a Berner database that contains all of the different pedigree information for Bernese Mountain Dogs since Adler was young but I never knew they sent these to those of us who had joined the sad ranks of the now Berner-less. I also received many kind emails from Berner owners across the world expressing their condolences for the loss of our precious girl. 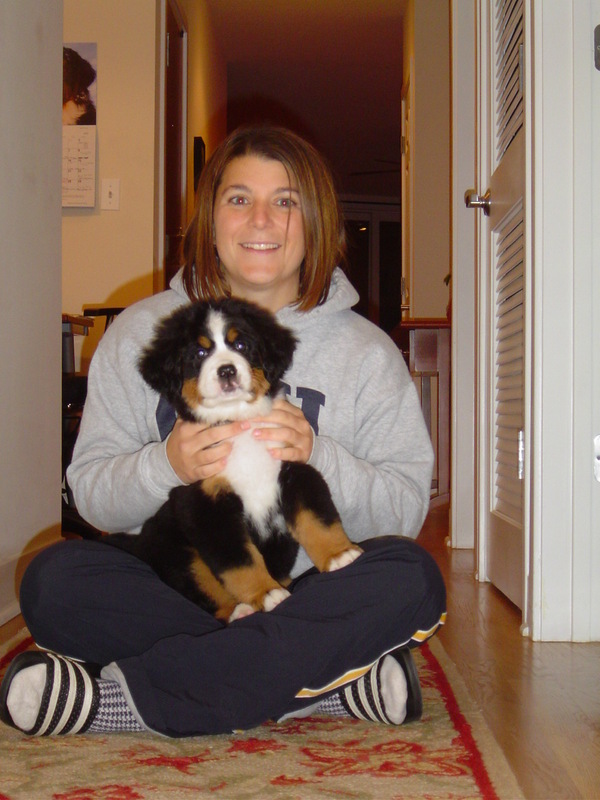 Yes, Adler was part of a unique and striking breed, but she was also part of this awesome Berner community. I will be forever grateful to her for introducing us to them.